With Sunday's 24-18 win over the Jaguars, the Eagles not only hit their bye week, but also the midway point of their season. Needless to say, at 4-4, 2018 has not gone the way the defending Super Bowl champs expected. And things aren't likely to get much easier in the second half, as their schedule is only going to get tougher. A lot tougher. NFL trade rumors: Are Eagles in on DeSean, Clinton-Dix or DeVante Parker? The Eagles' opponents so far are a combined 25-34-1 (.425) and just two of the eight teams are over .500 (the Vikings and Panthers, both games the Birds lost). The Eagles four wins have come over teams with a combined record of 10-21 and have yet to beat a team with a winning record. But that's going to need to change, because over their final eight games, their six* scheduled opponents are a combined 28-17 (.622) and four of those six teams are over .500, including the 6-1 Saints and the 8-0 Rams, both of whom will host the Eagles before the end of the season. *It's only six because they still have to play Washington and Dallas each twice. In other words, they'll need to start beating some winning clubs if they hope to make another postseason run this year. But this team has hardly been able to put away the bad teams, and head coach Doug Pederson knows they must improve in order to survive into January. 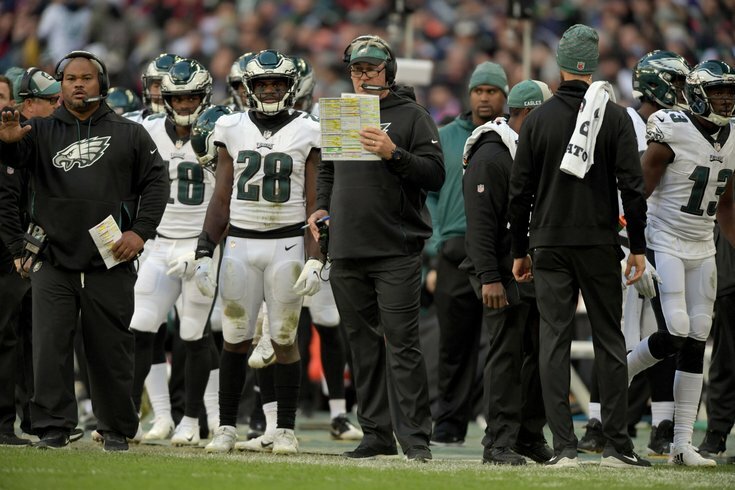 "I think that we have to continue to get better on third down, even though we were pretty good in the game the other day," Pederson admitted on Monday. "Red zone efficiency has got to improve in the second half of the season. We have to score more points. Those are things that I take note of, obviously. As a play caller, I get to control that some. Then defensively, I think our red zone defense is playing extremely well and we are holding teams to three and not seven, which is really good. "So, we just have to keep improving. We have to get better. Hopefully we get some guys back healthy in this second half of the season. We know our division: we have five division [games] in the next eight weeks, so that’s a challenge, but everything is right in front of us." Pederson is right about a lot of things right there. They have to get better. They have to win their division games. And they have to get healthy. Unfortunately, that last part is out of the coach's hands, because they have a lot of banged-up bodies, many of which won't be back this season. And with the NFL trade deadline on Tuesday, it's worth wondering if the Eagles will make any big moves to help put them in a better position heading into the second half of the season. "Well, let me say this: I’m very confident and comfortable with the guys we have," Pederson said. "I’m very confident in those guys and in this group. We are constantly looking. If we can add value and if we can add talent anywhere on the team, we are going to look at that. Howie [Roseman] is going to look at that. And so, we’ll see. We have a little bit of time here over the next couple of days. "If it values the Eagles and helps us win games, we’ll see." During his final presser before the deadline — and possibly his last until the Eagles emerge from the bye — Pederson went on to talk about the role injuries play in his desire to make a move, how the back-and-forth between him and Howie Roseman works and more. How have the injuries played into the decision whether or not to make a trade? PEDERSON: I mean, you’ve got to look at it a little bit from an injury standpoint because we have missed some guys during the first part of the season. But I don’t think that’s the sole purpose for making a move. I think it has to be the right person, it has to be a character fit and it has to fit what we do offensively. And if it values us and helps us win games, then we will stay aggressive that way. That has always been our mindset. When you get close to the trade deadline, what is your role in that process? Does Eagles Executive Vice President of Football Operations Howie Roseman say ‘here are a few guys we’re thinking about’ and you look at tape or does it not get to that point until talks are heavier? PEDERSON: It’s hard because we’re game-planning and stuff leading up to all this for us to spend a lot of time evaluating players and all that. Howie and I have been in direct communication and talking about certain things and scenarios, this, that and the other. If he has a handful of guys, you know, whenever you can find time you look at them and see if that person fits. That communication is always there and it’s really been a good process. Do you bring up needs with Howie? PEDERSON: One of the things with he and I is we are both on the same page with all of that. We look at our roster, and again, if it is an area that can help us win games in these next eight weeks and hopefully beyond, we are going to maintain that aggressiveness just like we did with [RB] Jay [Ajayi] a year ago and that helped us win a championship. That is all a part of this process. Going back to the roster, how tough is the whole process when you have guys on injured reserve who may or may not come back? PEDERSON: Well the one thing with that is you have time with these guys who come back. You don’t have to make a decision right away, so you get a chance to see where the injured guys are at in practice and all that before you make any kind of decision, so you have a little bit of time there and that is kind of where we are at right now. Stay tuned for the latest as Tuesday's NFL trade deadline approaches. RELATED: NFL trade rumors: Are Eagles in on DeSean, Clinton-Dix or DeVante Parker?